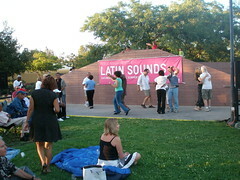 Bring your dancing shoes for this hot finale to LACMA’s 2008 Latin Sounds concert series. Angel Lebron y Su Sabor Latino have been heating up clubs across Southern California, performing Latin music that originated in New York City and placed salsa on the map. With their Palladium-style look you’ll feel like you’re back in the sixties and surrounded by the sound of classic street salsa. If you haven’t attended this music series, I highly suggest that you do so tonight. Last week, we went to our 4th one and while the music was a little too “Adult Contemporary Jazz” for our tastes, that didn’t stop the crowd from dancing and the kids from running wild. Added bonus, after the concert was over a couple of the musicians came over to a family near ours and jammed for a couple of hours afterward. There were even extra instruments so that we could all participate in the fun. The concerts are held in the amphitheatre behind LACMA east and begin at 5pm. Pack a picnic, bring some blankets and get your dancing shoes on. There is street parking (iffy), parking across Wilshire Blvd. and musuem parking ($7) available. Wine and beer are sold on the patio if you forget to bring your own. My family and I will most likely be there, and I’ll bring along my laptop (LACMA has wifi!) and will try to post some videos either via Seesmic or my blip.tv account. Hope to see you there!